This lady was sitting among hundreds of brightly coloured phulkari dupattas as if sitting in a garden full of flowers . She had a stall in Dilli Haat and had come from Patiala to sell these Phulkari dupattas hand embroidered by young girls from Punjab. Phulkari literally means phul which means flower and kari means work. 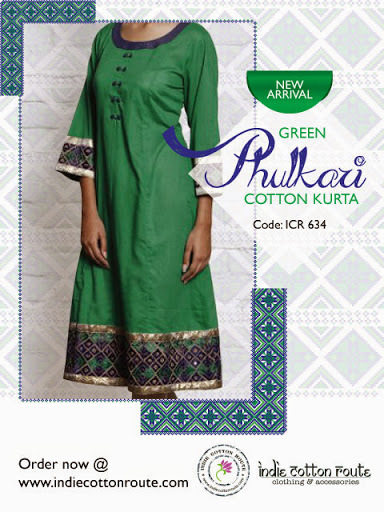 Phulkari played a very important role in a girl's life for her trousseau and festivals. It was not meant for sale and the completion of a phulkari dupatta represented the girl becoming a woman and she would then be ready for marriage. The embroideries were a reflection of their lives and thoughts. The motifs were inspired by their surroundings and each girl had her own way of expressing them. What an interesting way to let go of your emotions and making a beautiful creation as a by product ? The modern ways of letting go are quite the opposite ! I wonder sometimes have we actually progressed ? 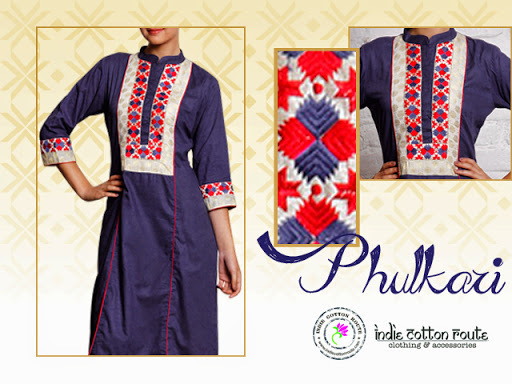 Not much is known about how phulkari work started but it has been mentioned in the Punjabi folklore of Heer Ranjha . Generally the colours are bright and red, orange , yellow and pink are some of the favourite colours . A phulkari is worn by the bride when she walks around the sacred fire , the first time when she goes out after giving birth to a child , important festivals and also when the woman dies she is covered with a phulkari. I was so keen on getting phulkari work done on my fabrics that I handed over a lot of fabric to the lady from Patiala but I never heard from her after that. To this day whenever I go to Dilli Haat , my eyes wander looking for the lady sitting in a garden of Flowers.